Lindsay Moynihan Archives - Book.Blog.Bake. Eighteen-year-old Simon Peters wants to stand up for the truth about who he is. His love for Stephen is unwavering, but does he have the courage to defend it when his entire church community, including his eldest brother has ostracized him? Trapped in a cashier’s job he hates, struggling to maintain peace with his brothers after their parents have died, and determined to look after his mute brother, Simon puts everyone else’s needs before his own. It takes a courageous act of self-sacrifice on Jude’s part to change both of their lives forever. Jude, who knew that when the fig tree in their yard began to bloom, it was his time to finally be heard and to set Simon free. I’m not sure what I was expecting with this book, but whatever I got was totally different. This is one of those hard books to review because this is a good book–a really good book– but I’m not actually sure if I like it or not. On the whole, I would say I do, even though it was pretty depressing at times and I’m not sure it’s a book I would want to re-read often or at all. If I was going to describe this book in one word, it would be gritty. From the small, Loisusiana town that’s rotting away, to the four brothers trying to make it on their own, and the struggling cast of characters, this is not a pleasant slice of life to immerse yourself in, even if for a few hours. That being said, I did need to know what happened that I ended up reading this book in one sitting and completely lost track of time. I got entirely sucked in to Simon’s story. From the impression I got reading the summary for this story, I thought the majority of this book would be about how Simon dealt with being ostracized in his town due to his relationship with Stephen. While that certainly plays a part in the story, there’s a lot more than just that. Simon, in short, has a pretty crappy life. Paul, the oldest brother, is one of the most frustrating characters I’ve ever read. He’s abusive, controlling, and hypocritical. Luke, Simon’s other older brother, might agree with Simon but refuses to speak up. Simon’s job is awful, he’s the only one who seems to make any real effort to make their household run, his boyfriend was sent away by his parents, and he’s constantly having to pick up other people’s pieces. Basically, I would not want his life. Simon is probably the only reason I was able to continue reading this book–I think otherwise it might have been just too depressing for me, but I felt for Simon as a character. His struggles really shine through the page and he just can’t seem to fit in anywhere. It’s not until he really has the opportunity to care for himself first that he makes any real progress, and by that time I was rooting for him for so long that any little improvement in his life seemed like a huge accomplishment worth celebration. From a writing standpoint, I found the book engaging and well-written. There’s quite a bit of biblical allusions and symbolism that I enjoyed spotting, even if it was a bit heavy-handed sometimes, though I don’t know if most readers would pick up on it. Things like Simon’s full name–Simon Peter, aka like Jesus’ disciple Simon, who was renamed Peter, the fact that all the brothers have biblical names, and the fact that the tree in the title is a fig tree are just a few examples of that symbolism. The ending was a bit. . . vague. While there’s some resolution to Simon’s story, and quite a few things happen near the end, I would have liked to see a little more. The ending does FEEL like an ending, so it’s not like the book was cut short, it just left a few too many things left unknown for my taste. Not that I expected everything to be completely wrapped up in this story, because it’s not that kind of book, it would have been nice to just know a little more. Final Impression: This isn’t an easy or fun book by any means, but it’s a good one. It’s gritty and very dark at times, but is also intelligent and has a few really great characters. It’s not really as much about Simon being as outcast as it is his life in general, and I think this focus makes for a really well-done, if depressing, book. 4/5 stars. 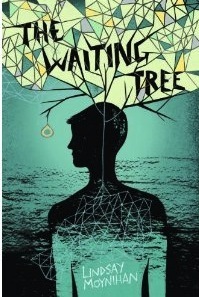 You can find The Waiting Tree on Amazon, Barnes and Noble, or The Book Depository.